What is Duck feet posture? Look down at your feet. If your feet are pointing outwards, then you have Duck feet posture! This is the easy part! …The difficult part is determining where it is originating from. Which area is causing the out turning of the feet? Note: It is important to understand the EXACT cause of your Duck feet posture. This will determine the specific exercises that you will need to focus on in order to address it. This is where the pelvis rotates in a backwards direction. A posterior tilt of the pelvis will ORIENTATE the hip joint outwards which may lead to out turned hips, knees and feet. If you have a Posterior pelvic tilt, the ASIS will be higher in comparison to the PSIS. This is where the hip joint rotates outwards on the pelvis which may lead to out turned hips, knees and feet. Note: Hip external rotation can occur in conjunction with posterior, neutral or anterior pelvis. Whilst standing, look down at your knees. If you have Hip external rotation, the knees will be pointing outwards. This is where the tibia rotates outwards on the femur leading to out turned shin bones and feet. Note: It is common for this to occur in conjunction with Knee valgus (Knock knees). This leads to out turning of the feet. Assume the lunge position so that your knee on your front leg is touching the wall. Whilst keeping your knee in contact with the wall, keep sliding your foot back as far as you can go. Measure the distance between the tip of your big toe and the wall. Results: If your toe is <8cm from the wall, then you have limited ankle dorsiflexion. A collapsing medial arch of the foot may result in out turned feet. Whilst standing, have a look at your feet. There should be an obvious arch on the inside of your feet. As a rough guideline: You should be able to fit the tips of your fingers underneath the arch of your foot. If there is no gap between the bottom of your foot and the floor, then you probably have foot pronation. Changes to the structure of bones/joints that encourage the out turning of the feet can result in Duck feet posture. Unfortunately – these are not amendable by means of exercise alone. As a result, the foot turns outwards to better position the femoral head in the hip socket. Bend your knee to 90 degrees. Results: If you have excessive external rotation AND minimal internal rotation (around 0 degrees), then you may have Femoral retroversion. The knee joint is structured in a way where the tibia is naturally sits in an externally rotated position as compared to the line of the femur. Bend your knees to 90 degrees. Result: If the foot is angled outwards in relation to the line of femur, then you may have tibial external torsion. In most cases – it is the net result of multiple postural deviations (including others that are not mentioned above) that can lead to duck feet posture. 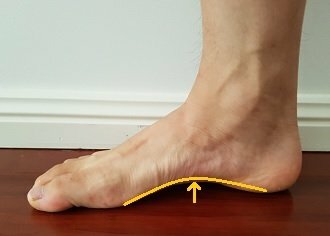 Why is Duck feet posture a problem? … How can you move properly if your feet aren’t even in the right position? As the feet are your base of support, out turned feet may lead to undesirable compensations throughout the whole posture. Note: These exercise are designed to be performed pain-free. If you are unsure of anything, please feel free to contact me on the Facebook page. I have a complete blog post on addressing this issue. Check out the post: How to fix a Posterior pelvic tilt. 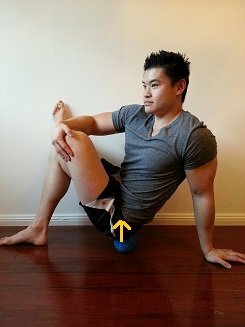 Place your hamstrings on top of a massage ball/foam roller. Apply an appropriate amount of body weight. Make sure to cover the whole area. Duration: 2 minutes each side. Whilst standing, place your leg in front of you. 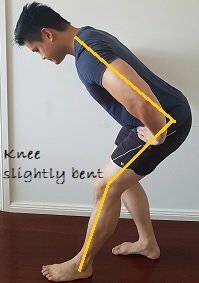 For upper hamstring: Keep knee slightly bent. Hinge forwards at the hip joint. Keep your back completely straight. Ensure that you can feel the stretch in the back of your upper leg. Hold stretch for 1-2 minutes. Stand with your hips stacked directly over your ankles. Relax into a neutral pelvic position. Place your gluteal region on a massage ball. Sit down on the edge of a chair. Place your ankle on the top of the knee of the other leg. Sit as tall as possible as to create an arch in your lower back. Whilst maintaining this arch, pull your knee in the direction of the opposite shoulder. Stand up with your legs slightly bent. Make sure your feet are pointing forwards. Place a block between your knees. The block should be wide enough to keep knees pointing forwards. Squeeze your knees together as hard as you can. Proceed to apply pressure onto the ball. Straighten and bend your knee. Sit down with your hip/knees bent at 90 degrees. Keep your knee pointing forwards. You can hold it still with your hands. Make sure your foot does not lift off the ground. Stand up with your feet facing forwards. Whilst keeping your knees slightly bent, push your knees outwards. Do NOT lift any part of your foot off the floor. Aim to feel your foot arch and glute muscles activate. You can place a resistance band between your knees to make the exercise harder. Check out the post here: How to improve your Ankle dorsiflexion. Roll your leg from side to side. Do this for 1-2 minutes each side. Keep your heel planted on the floor. Learn forward into your ankle. Aim to feel a deep stretch sensation at the back of the calf. Place your foot onto a stool. Using your body weight, proceed to plunge forward as to place pressure on the front ankle. Keep the heels of your front leg in contact with the stool throughout movement. Check out the post here: How to fix flat feet. 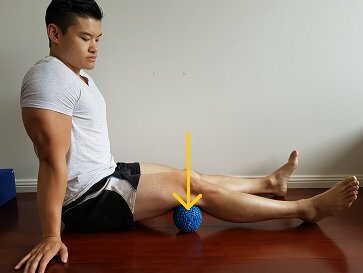 Place the outside of your lower leg on a massage ball. Apply pressure over the ball. Make sure to cover the whole outer side of the lower leg. Draw circles with your ankle to increase the release. Stand with your feet facing forwards and shoulder width apart. Whilst keeping your toes relaxed, proceed to scrunch the under-surface of your foot. Imagine that you are dragging your big toe backwards. Aim to feel a strong contraction of the muscles underneath your foot. Hold this for 5-10 seconds. Keep your arches lifted throughout the exercise. Keeping your legs straight, lean your whole body forwards from the ankles. You will need to dig your toes into the ground to prevent you from falling forward. You can perform this exercise in front of a wall if you feel you are going to fall forward. Use your feet/toe muscles to prevent yourself from falling and return to the starting position. … What’s the point of doing these exercises if they don’t translate to what’s important to you? In addition – I would also recommend that you attempt to keep your feet straight (without forcing it) whilst standing, walking, exercising etc. With time, consistency and effort, it will be come more natural for you to place your feet in the neutral position. There are 2 situations where this can occur. 1. You have a 1 sided issue: If this is you, just complete the above exercises on the appropriate side only. 2. Your pelvis is rotated: A twisted pelvis can result in one out turned foot. In this case, check out this post: How to fix a Rotated pelvis. Duck feet posture is a postural presentation where the feet are turned outwards. It is important to understand what is causing your duck feet posture as this will determine the exact exercises you should do to correct it. If you only have 1 foot that is out turned, it is recommended that you perform the exercises on one side or address your pelvic rotation. Anterior Pelvic Shift: How do I fix it? Scoliosis exercises: Improve your alignment! I want to ask my right glute is smaller than my left and my right hip is more externally rotated . What do you think is? There may also be something happening with the hip itself. It is possible to have one different problem for each leg. Like, for example having tibial external rotation in one leg and in the other limited ankle dorsiflexion? 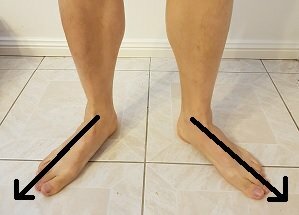 My right foot is duck footed since i was a kid if i complete these techniques daily can the fix themselfs or adjust it. Do i have to do this like a regement daily? As long as your duck foot posture is not caused by your structure (bone/joint alignment), then these exercises will help correct your foot position. I would perform they as regularly as you can. first of all, thank you for taking up your time to write such articles, they are trully wonderful. I think I might be facing with the duck feet myself. My knees are alway straight and whole leg rotated from the knee down. I do have some realy big and well developed calves muscles. Could this be the source of my problem and how would you suggest to approach it? If you have tight calves, I would also check if you lack ankle dorsiflexion as this can predispose you to have your feet turned outwards. thanks for your reply. I dont believe I have limited ankle dorsiflexion – it is quite OK actually. It just that my feet are rotated from the knee down. I have been like this for quite some time now, maybe more than 10 years, but started to give it atention in the last 2 weeks unfortunatelly. 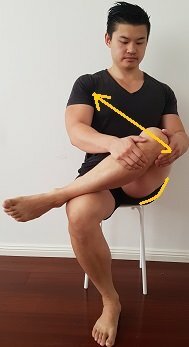 Do you think it is too late to overcome this disfunction and should I only do popliteous strenghtening exercises and knee push outs or should I also try something else? If you lower leg bone is rotated outwards, then it sounds like a tibial external rotation issue. If it is not structural (bony alignment issue), then it is possible to improve it. The exercises mentioned on the blog post will help address the position of your knee. Hi Mark i like your blog so much it is great and maybe it is because of ı have many postural problems… I have anterior pelvic tilt and at the same time duck feet (hip externally rotated and tibia externally rotated) should ı do glute strechs ? I am afraid of it because of my APT. I have most of this. Femoral anteversion, anterior pelvic tilt (which I have improved some in the last months), knee valgus, external tibial torsion, and my Arch is high /suppinated. This has stopped me from fitness my whole life and I’m tired of it. Stretches do very little to correct it. So I started barbell training – starting strength. It took me weeks just to perform a bodyweight squat. Then goblet squats for months. Now I’ve had some success with a Rippetoe style low bar squat. I got 3/4 inch heavy squat shoes – they help me get lower without rolling out those high arches and I’m a very tall, long femured lady. Rippetoe recommends for all a shoulder width stance (more seems impossible due to my hips), pointing the feet out 15 to 30 degrees – ok, natural for duckfooted me. But that part about shove my knees out? That’s difficult for me and he says it’s the key. I squat with a band on my knees and I’m up to about 100 lbs. Below parallel depth is a challenge. Should I squat differently? Am I gonna tear an ACL? Am I gonna hurt myself? I’m ready to see a doctor about this for the first time since I was 6 (he said hey surgery or just walk funny) and surgery is off the table – what kind of doctor do I see to get cleared for some really heavy squats? Every one is structurally different. With these natural differences, it may not be possible for you to have the “100% perfect” squat form… and that’s okay! Sure, “push your knees out” is a great cue for squatting, but it might not be comfortable (or even possible) for someone with high arches and femoral anteversion like yourself. It sounds like you have made some great gains at the gym already and I would encourage you to keep going with what you’re doing. Obviously – you will need to SLOWLY increase the weight without losing your best relative form. This will allow the body to develop the capacity to handle the extra load on your structures..
With long femurs, low bar squat is the way to go! You will need to likely lean forward a bit more from the hips to maintain your balance however. Mark, this is a nice and very detailed article. I’m a cyclist and I think my riding over the last few years (without much stretching, sadly) has caused some issues. Is it possible to have over supination and duck feet? My shoes wear badly on the outside of the heels, and I tend to have duck feet stance. My massage therapist says that my IT bands are very tight, and I have soreness in my hip area which I think is is tightness in my TFLs (I’ve never had it diagnosed but it seems like the right location). I assume all of this is connected…..weakness in either the TFL or gluteus medius causes tightness in the IT, which pulls my feet outward. Seem plausible? 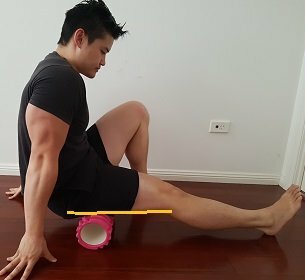 Outside of the dreaded foam rolling of the IT band, any suggestions on other stretches or strength exercises I should try? You can definitely have duck feet even if you have supinated feet. If your feet are structurally bound that way, there is not too much we can do to change the positioning of the foot itself. Is your rotation coming from the pelvis, hips, knees or ankles? This will give you the best idea as to where to start your exercises. 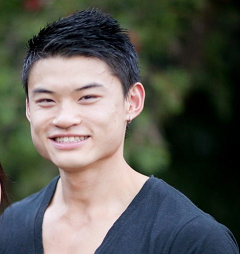 Love the website – you’ve done a great job on all of your articles and they are very helpful. Naturally I seem to have my knees and tibia forward but one foot outward. However, an x-ray showed I had my right hip tilted forwards and my femur rotated inward / tibia outward. I can get my legs and feet to face forward but I can’t get the ball of my big toe to touch the floor when I’m doing this. I would love to do all of these exercises everyday but it’s just so much – what would you recommend I do? Do you have a physio practice in the UK? Have a quick look at this picture. Do you have forefoot varus? If so – the structure of your bones in your feet might be preventing you from getting the ball of the big toe down on the floor when you straighten out your leg. No problem! It resembles that but if I really really try I can force the ball of my foot downwards. I saw an osteopath recently who advised me I have limited ROM in my big toe and this could have led to all of this. Bit confused as of where to go now, I cycle and run a lot and I’m worried about issues down the line. Big toe tightness into extension can force your foot to turn outwards. If this is the main issue causing your duck feet posture, then I would start working on improving big toe extension. I’ve been working on big toe mobility and have seen some improvements over the last month in terms of being able to flex etc. I am still really struggling with my leg though and if anything I feel like it’s worse. I’ve also worked on spinal rotation and have much more rotation in my upper body. I have made an observation that after a difficult run / cycle my foot points out a lot more and my knee points even even more, implying that a particular muscle or set of muscles is just too weak to support my leg in a straight position and fatigues quickly. I get pain on the right side of my hip/glute almost on the femur itself and lots of tightness / aching underneath the achilles / up the back of the lower leg. I’m getting stuck for ideas and it’s really affecting my ability to improve my running. Do you have any other ideas? Sorry to pester but I really do appreciate your advice! If your knee AND foot point outwards, I would check your glute muscles (external rotators of the hip) to see if they are tight/over active. If you have issues only on the right side after you run/cycle, check to see if your pelvis is level as this could be placing more load on that right side. Thank you so much!!! This is all so helpful. I am grateful that you have managed to put such a comprehensive post on the issue of Duck Feet together, I think it will prove to be very helpful. However I have at least a couple of questions for you. 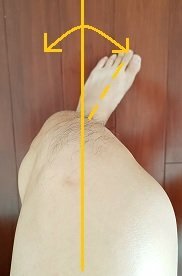 First of, what is the difference between externally rotated tibias as a result of genetics vs muscular imbalance, how do I find out which one I am dealing with? Just so that I know what can be done about it. Second, in my case, as I keep my knees straight, the tibias are actually tilted outwards somewhat (wider distance between ankles than knees. As if pressure on the knees makes the tibia cave and go outwards to keep in balance). How do you propose this can be dealt with? Thank you so much for the work you’ve put into this. Your genetics will determine if you are structurally “built” with externally rotated tibias. If you are able to change the position of the tibia to more relatively internally rotated position, then you do not have a structural issue. This means you can influence the resting joint position. When you say the ankle gap is larger than the knee, do you mean you have a degree knee valgus? 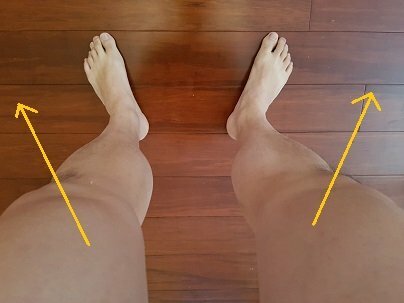 If so, this post might help : How to fix knee valgus. A few months ago, I started doing a lot of squats in an effort to get into shape, which was when I noticed that I had duck feet. I’d never really noticed them before, but then I saw that whenever I did a deep squat, my feet would turn outwards. Even when I tried to keep them straight, that just made my knees point inwards. So I Googled it, found your website (this is a really useful site by the way), and deduced that I have flat feet, tibial external rotation, and weak gluteals. I really want to fix these problems, but at the same time I’m worried about losing my progress with my squats. 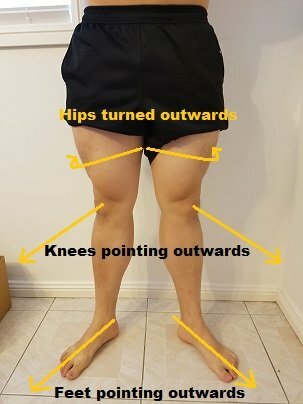 So here’s my question: should I give up my poor-posture squats until I fix my leg problems, or just start doing your recommended stretches / exercises at the same time as squats? You can continue to do your squats, but just be mindful that it could potentially lead to injury further down the line. But I would definitely start to address your technique and posture if you want to stop your knees from caving in. How to improve ankle Dorsiflexion. If the clicking is coming from the front of your knee, it is likely due to the misaligned position of your patella. Think of your patella as a train. The train needs to sit directly on top of the train tracks. Any deviation from this line of tracking will increase the chance of the patella rubbing against the bone behind it. is their another exercise to strengthen politeus muscle! The popliteus is a tibia internal rotator and a knee flexor. Any exercise that encourage any of these movements will engage the muscle. As you push OUT your knees, make sure the feet do not roll out. This will hit the popliteus as well as the glutes. A tight adductor and/or internal rotator might cause your pelvis to move when turn out your hips. 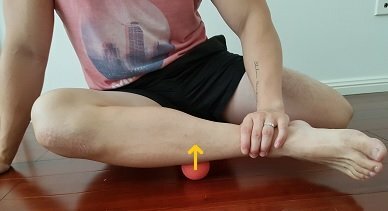 Here is a post for your knees: How to fix knocked knees. I’ve had duck feet since I was a child. When I jog I get bad pain down the outside of my lower legs. It doesn’t happen for my first or second jogs but when I do more it starts – by the 6th or 7th jog it’s excruciating and I have to stop. The pain goes away as soon as I stop moving. But the site is tender when pressure is applied. Is there a correlation? Is there anything I can do? Sounds like it may be due to over activity of your tibialis anterior or possibly extensor digitorum muscle. These muscles tend to be over active in people with duck feet posture. If your knees are forwards but your tibia (lower leg bone) is pointing outwards (… with the ankles/feet following this direction), this would mean you have a degree of Tibial torsion. In this case, you will need to improve your internal rotation of the tibia on the femur with the medial hamstring and Popliteus muscle. 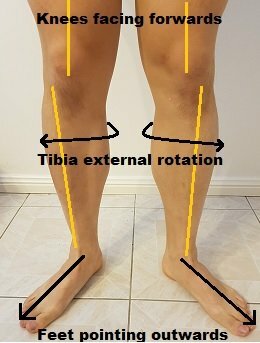 If your knees AND tibia are forwards BUT your feet are pointing outwards, I would say you either have very poor Ankle Dorsiflexion (see this post), and/or weak arch muscles (see this post). Hi I’m a collegiate sprinter and i have this issue. Ive been told if i fix this I’d be able to use certian muscle groups more effectively and in turn run faster and also suffer from less leg pain. I cant really tell if i have tibia external rotation or hip external rotation. My knees seem slighly turned but i can’t really tell for sure and my tibia seems slightly off but again i cant tell for sure. Also how long will strengthening the proper muscles to fix duck feet roughly take? If your knees and feet are pointing outwards, it is more likely the hips are externally rotated. In this case – You will need to focus on stretching out those muscles that externally rotate the hip, and then strengthening the hip internal rotators. This article is really an eye-opener. I’ve seen a lot of people with duck-feet. I am amazed to know that there are ways how to correct it. Can u have duck feet with an anterior pelvic tilt rather then a posterior tilt? I am new here, but I read a few of the articles and my I really liked your blog. I have a question. Please try and answer it, I will be really grateful! I am a 16.5 year old guy. My height is stuck at about 5′ 4″ for 2 years now. It might be because of my very poor posture. Due to inactivity and sitting, my posture has got really bad. 1. 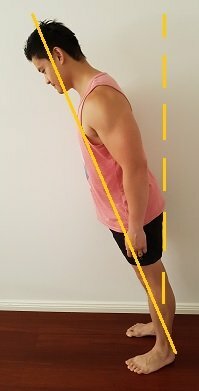 Can I really increase my height if I correct my posture? 2. Which posture exercise should I first target if I wish to increase my height as soon as possible(the height due to posture)? I mean, hunched back has different exercises than APT, so which one should I target first for height? I know you might be busy, but please reply! Addressing your posture may help you increase your height to a degree. Perhaps start with the hunch back posture and see how you go from there. If you have time on your side, you can do your APT at the same time. as I read through your post, it seems that my problem is actually the externally rottated tibia/fibula. 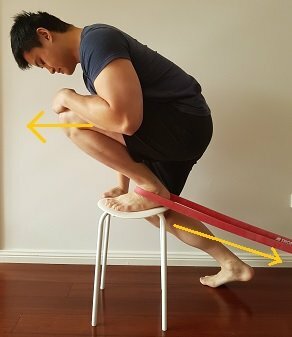 Apart form the popliteus, is there a good way to isolate and strenghten only the medial hamstrings? Can you suggest a good approach. Thank you for the great articles, you have helped a ton! It is very difficult to isolate a single muscle with any exercise, but if you want to emphasise the medial hamstrings to internal rotate the tibia relative to the femur, you can still use the strengthening exercise for the popliteus muscle exercise. Is there anything else I could do in order to improve my situation here. I have been doing both biceps femoris static releasea and stretches, the popliteus exercise, the knee push out plus a ton of other hip external rotation exercises almost daily for the whole summer , plus I do squats , deadlifts, Bulgaria split squats, you name it , and unfortunately I don’t see any improvements. My legs knee down are still rotated outwards in a relaxed position. Any additional guidelines would be much appreciated. If so – you may not see any significant improvements with increasing the control of those muscles you mentioned. Well, I think the whole tibia/fibula is somehow missaligned relative to the femur. I think it is exactly how you described it in post. Also, If I do have structural tibial torsion, how should I approach it ? Structural tibial torsion is due to the shape of your bones/joints. If this is the case , there may be some limitations on the extent of changing it. I am pretty sure now, that I don’t have structural tibial torsion. It is my tibia rotated at the knee joint, but once I got a better understanding of the structure of the lower leg an muscle I started to realize, that I do have quite big calves and that my lateral ones is almost always tight. 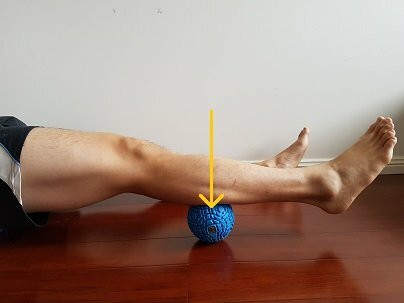 Can this be the cause of the problem and is there a way to Target the lateral calf with a stretch and train the medial calf with some exercise. 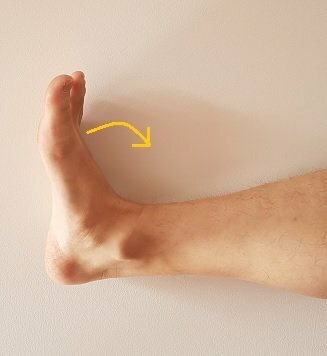 Can you please make a post about hyperextension there is not much about it on internet, also i have only my tibia pushed away like a bow leg but not the femur. Thanks for the suggestion. Will keep it in mind. In the meanwhile, feel free to message me on facebook and I can help you out there. Hi Mark! I have a question about the exercise. Could you send a photo of this exercise, as it is not very clear how to do it. 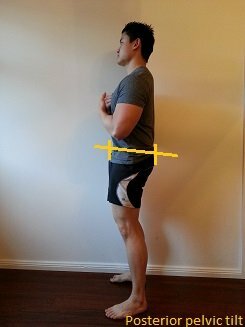 Why do I have Duck Feet and limited internal rotation, but with ANTERIOR pelvic tilt? Sounds like you have Anterior pelvic tilt with tight External rotation fibres of your glutes. This can cause a restriction in your hip Internal rotation and cause the out turning of your foot. When I walk I notice that my right foot is swerving to the right. I have a left pelvic rotation. Do pelvic exercises are sufficient to repair the shaper. If you have a left pelvic rotation with a right leg that sticks out, chances are that your hip external rotators may be very tight. Stretch them out and see how that goes. Great post. Off topic, but will you release a blog post on how to fix a hiked shoulder? Thank you! You must be psychic as I am actually working on something related to uneven shoulders! Hello mark,i cannot feel any pain when rolling biceps femoris, can my tibial torsion be caused by the tfl? I also have knocked knees. But when i try and rotate tibia in it goes away (but i cannot hold this godly perfect position). PLS REPLY AND HELP A POSTURELET OUT! You can try releasing that TFL (Hip internal rotator) and see how you go with that. If only one foot is pointing outward does that mean that side of the pelvis is rotated forward or that the opposite side is rotated forward? And thanks for being the FIRST comment. As a way of showing my appreciation, please message me on facebook and I’ll personally help you out there. To answer your question – it can be either! Thank you so much for making these wonderful, detailed articles. You’re truly great at what you do! I was wondering if you could offer me some advice. Unfortunately, I’m pretty certain my pelvis is shifted in every plane it could be. More specifically, my hip is hitched up on the right side, I have a Left Pelvis Rotation, and a Posterior Pelvic tilt. My left shoulder/trap is higher then my right (probably due to the hip hitch) and I tend to have duck feet. I think this may all stem from and injury to my left knee/quad many years ago I incurred when squatting incorrectly. My left VMO is undeveloped because my body/brain does not seem to want to put that much weight on it or maybe I just cant really use my left leg correctly. Anyway I know I’m a mess lol, but I was wondering if you had any general advice. Do you think there is any particular place I should really spend my time focusing on strengthening or stretching? I’m thinking I may have overlap because my body is so twisted up that I may get more bang for my buck so to speak by focusing more effort on one particular area. Sounds like you have trained yourself into your current posture following your injury. This will your body get used to placing equal weights through your legs, and thus help with the postural compensations throughout.